Cerro Bayo offers a pleasant and diverting way of spending 86 minutes. My initial response was ‘Almodóvar lite’ or ‘telenovela plus’. I hope that isn’t too much of a putdown because I enjoyed the film. Writer-director Victoria Galardi has several things going for her including a good cast and a beautiful setting in Villa La Angostura, in the Andes of Western Patagonia close to the popular ski resort on Cerro Bayo. The script has its comic moments and she’s only really let down by the occasional clunky sequence and a rather weak resolution to the narrative. The plot hinges on the drastic action of the mother of two middle-aged women. After winning some money at the casino she buries it under the headstone on her husband’s grave and then attempts suicide – but only manages to put herself into a coma. Cue the return of her older daughter Mercedes from Buenos Aires sniffing around for the money while the younger daughter Marta sits by her mother’s bedside. Marta’s husband meanwhile is inveigled into a plan to sell his mother-in-law’s plot of land to some Spaniards. Her son needs money to travel to Europe and her daughter is obsessed with winning the local beauty contest. There are more old memories for Mercedes to turn up and the usual small town relationships to disentangle. I don’t think that there is enough here to warrant a UK distributor picking up the film, but I’m glad I saw it all the same. I’ve not seen this part of Argentina represented before and it made me think about how this country (the 8th largest in the world) has so many varied landscapes and narrative possibilities for filmmakers. 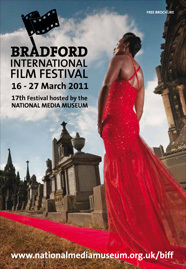 This entry was posted in Argentinian Cinema, Festivals and Conferences, Films by women, Melodrama and tagged Bradford International Film Festival. Bookmark the permalink. Re Patagonia, this seems to be an area of interest in recent Argentinean films. It may just be what is released, but I have seen more films set in the area than I remember from the past. Pablo Trapero’s films are exemplary in exploring this terrain.